I am not usually shy about my emotions. I will freely admit that I am a huge crier. Sometimes, I cry for no apparent reason. Then I cry some more, simply because I have realized that I am crying for no reason. Once, I cried because I realized I was crying off my eye cream. Would I ever cry in front of you unless I really knew you? Not a bat’s chance in hell. Even as I struggled with the 10 year anniversary of my brother’s suicide, I cried in the bathroom, refusing to tell anyone who noticed my red eyes why I was so distraught. Looking back on it, I question why? Why, in that moment of overwhelming grief, did I hide from even my friends? Because society tells us it’s not appropriate to grieve in public. Especially so long after the death. And that is where my biggest beef, and my story begins. I am a suicide survivor. No, that does not mean I attempted suicide (though I have gone down that path, and would encourage anyone who is on the same path to reach out and demand help, if the first person won’t help, go to the second, life is worth fighting for, it does, eventually, get better). It means that I was one of the ones left behind. 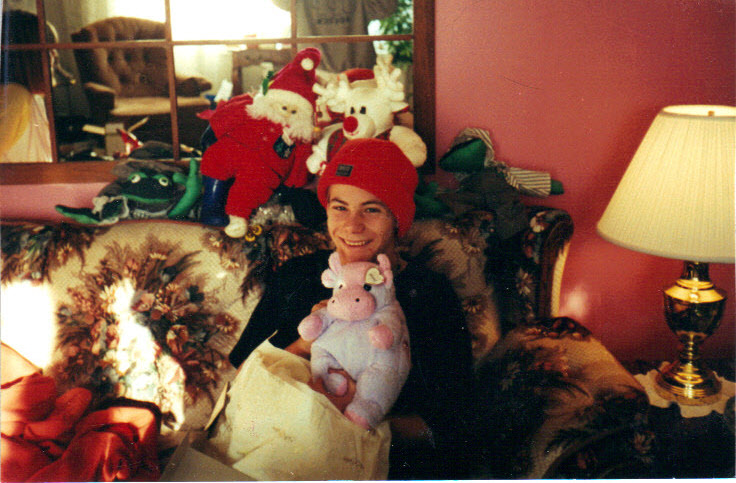 My brother Troy committed suicide when I was home sick on December 5, 2001. It was just 9 days after his 17th birthday. The night before, we had hung stockings on the new hooks my mom and I had bought for the entire family. I was the last person to see him alive. I was the person to call 9-1-1. I still remember every detail from that day–it was horrible, painful, like someone had punched a hole in my chest. And just like that, I became the girl whose brother committed suicide. We attend funerals, but there is a sort of disconnect. I myself have attended funerals of people who I barely knew, or had no strong emotional attachment to, or hadn’t seen in years. We like to contain grief to the wake and funeral, and expect them to occur quickly and in rapid succession. We bury people within a week. Society imposes limits, even for the family. After about a month, we want the people to move on. The loss of a loved one cannot mean loss of one’s own life. After the funeral, we expect grief to be private. We don’t like people to be sad, or to suffer. It’s even worse for children. Adults have usually experienced death, so they come equipped with better skills for empathy and compassion (this could also be related to the cognitive developmental stage, but before I go all Piagetian on you…it’s not that kids don’t want to understand how someone else feels, they just lack the skills to other-orient). As a child, it was hard for me to understand my own emotions, to understand why my brother would have killed himself. For my peers, it was hard to understand why I was so sad. Kids are supposed to be happy. Your biggest concern is supposed to be who won at double-dutch or soccer. I spent a number of years with the self-imposed label of Troy’s sister/the girl whose brother committed suicide, with many changes in my life bringing about new waves of grief. It’s a basic psychological fact that our experience of grief changes with age, but I didn’t know that then. Instead, I felt defective. I struggled with the typical survivor’s guilt. I tried to make up for the gaping hole in our family, in any way I could. I spent a long time struggling with the changes the loss had brought to me and to my family. I struggled to reclaim an identity that no longer existed, based on a situation that no longer existed. I took a number of wrong turns along the way. Death is never easy, and having someone choose death is even harder. In suicide, there is no preparation period. You don’t get a say. You are faced with a sense of complete and total rejection–you were not enough to hold them here. They may have thought they were doing you a favor, and you feel as if you were not loving enough to make them realize that they weren’t. You weren’t enough love for them. You were not important enough to make them stay. Before this all comes out as some giant sob story, let me clarify: my struggles have brought me to where I am today. I hate when people say “I’m sorry” when I tell them about Troy. My therapist calls it aggressive, but for me…You didn’t do anything, why are you apologizing? I realize it’s an expression of “I am sorry for your loss,” but I don’t like pity. Don’t feel sorry for me. My mom tells me I’m too much a prickly cactus, but it’s just one of my quirks. Once I let go of the old me, and the dysfunctional new me(s), I was able to see myself for what I was – and it wasn’t the “girl whose brother committed suicide,” or the “rejected one left behind.” I was a survivor. I made the decision to use my experience for the better – to go into psychology, and help people who (for whatever reason) felt like there was no end to their sorrow. Something funny happens when we are faced with suicide as a society. We don’t like the idea of people choosing when they die. The grief period seems to be shortened. Unlike natural deaths and accidents, the survivors seem to be blamed or contaminated in some way. They are less worthy of sympathy. It is the ultimate preventable death. This (often self-imposed) guilt is an added burden to the grief. And so we live with the guilt, almost as a way to atone for not doing something. We must learn to accept that it was not our choice to make, that there may have been nothing we could do then, or can do now. Tragically, my story is not unique–at least, not the broad category of suicide survivor. And those who attempt suicide and fail, they don’t even have a name. Perhaps this is reflective of society’s views? It suggests that those who would take their own life are not worthy of being human beings. Even by calling the loved ones left behind survivors, we say the suicidal person was a disease, plaguing the survivors…a plague that has finally been cured. We don’t like facing death. We don’t like sadness. We have to be functional and contribute to society. It’s what allows us to grow and prosper. Sadness disrupts our happy, prosperous, well-adjusted image of the world and our lives. And funerals, while they are helpful in creating closure and providing social support, are also a means to control grief – organize it into neat little boxes and separate ourselves from it. Those who aren’t particularly close to the dead person can go to the funeral, cry, and then leave and go about their daily lives. Those who are extremely close to the deceased are themselves given a relatively short period of time to grieve before they are expected to move on and go back to living as if that gaping hole in their chest isn’t there. God forbid someone grieve outside of society’s pre-determined periods. Society has moved on. It has to. If every time someone died an entire society came to a screeching halt until everyone had fully grieved, we would be completely dysfunctional. We would be gone the way of the dinosaurs a long time ago. The survivors must “move on” too, but perhaps it’s not fair for society to tell us when and how to grieve. In cases of suicide, the grief is almost shameful. We don’t want to even imagine how someone could want to die–even if they were in massive amounts of physical pain due to illness, we don’t want to let people choose death. It seems to reflect we have somehow failed. Why would someone be that sad? Why did no one help them? But what if we did try? What if we stopped trying to understand why, if we stopped calling it senseless and irrational? If we understood that it was a kind of pain and sorrow where death made sense, and let that be an individual’s belief…something that only has to make sense to them. We don’t have to understand it, or even accept it. But we are not in a place to judge another person’s thoughts or feelings as right or wrong, valid or invalid, rational or irrational. It’s a taboo area, which I think with some effort, could be less of a taboo. If we stop focusing on how irrational suicide is, maybe we can focus on helping them see hope. You don’t have to accept someone else’s beliefs, nor adopt them as your own, but telling them their thoughts are wrong, or stupid? No. We need to understand that they are in pain. We need to entertain the possibility that maybe their pain is as bad as a physical pain, that it could be enough to push someone over the edge. Not to be cheesy, but all my trials and tribulations left me with what some would call “scars.” For me, scar is not the right word. It implies flaw, something that needs to be masked or covered. My past is beautiful. Every mark is a reminder of how far I’ve come, of what I can do. They are not scars, they are stories.